Pagami was a wildfire back in 2011 that began as a lightning strike and then ended as a gargantuan government miscalculation that resulted in 110,000 acres within the designated wilderness of the Boundary Waters Canoe Area and an undisclosed amount of acres outside of the wilderness to be burned to the rocks. It traveled so far and so fast in such a short amount of time, that I wasn't sure if WE were going to have to evacuate. When they finally put it out after months of nail-biting and millions of dollars, we had time to reflect on the impact the fire had on the animals who could not possibly made it out in time. 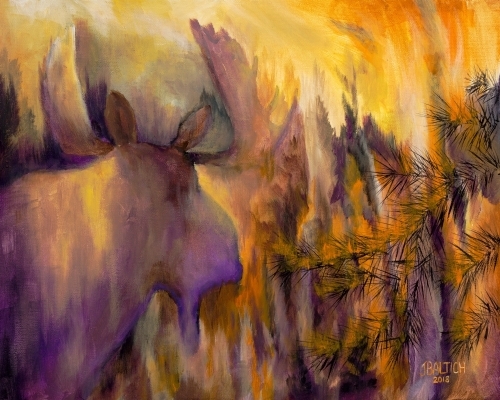 The fading moose in the flames is my depiction of Pagami. Despite non-wilderness people declaring fire to be part of the natural process in the wilderness, WE never want to go there again. This painting is my attempt to depict the deep sense of loss that wildfires bring to not only the people who live and work in wilderness, but the critters as well.